At some point after your surgery, your healthcare providers will discuss several things with you including the use of shrinkers,desensitization, positioning, contracture prevention, exercise, phantom sensation and phantom pain. To manage post-operative edema, you may be prescribed a shrinker or ace wrap as a means of compression therapy. 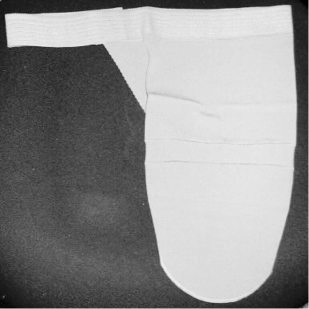 Shrinkers are elastic garments that are simply pulled on or wrapped around the limb. They are typically used when the suture line is reasonably healed. Until that time, an ace wrap may be used. Both methods help to expel excess fluid that remains inside the limb. This helps to prepare you to wear a prosthesis by providing an appropriate limb shape.